The Lilac Islander peppers are a gorgeous purple right now. 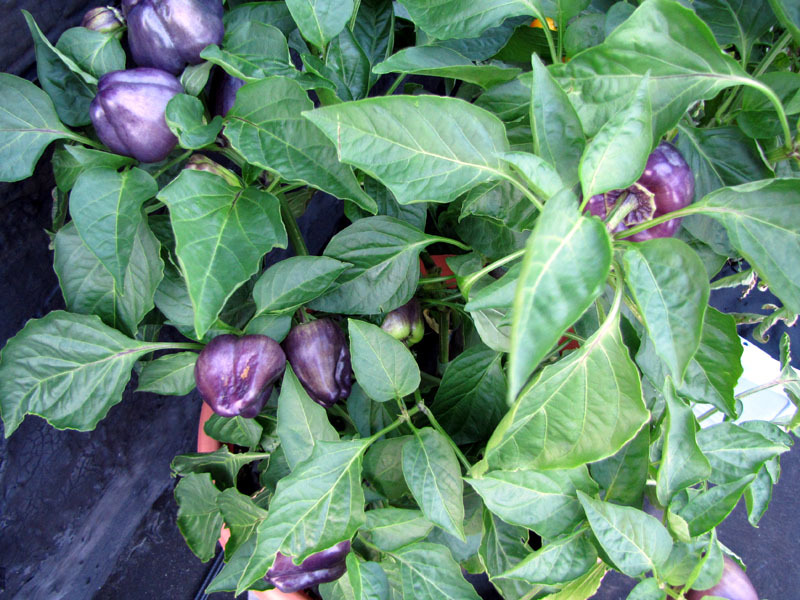 It's a very pretty vegetable plant well suited to a container garden. In fact, I think it would fit right in in an ornamental garden. I've had to trash a few peppers due to sunscald, but other than that all the pepper plants are doing well. The cherry tomato plant looks much better. After one application of organic fungicide I see very little advancement of whatever fungus has infected the plant. Just to be on the safe side I'll continue with weekly treatment until the plant stops producing fruit. The cucumber also looks much better. Dousing the plant with a strong spray of water has been an effective way to manage the spider mites. The plant is noticeably greener and perkier. I was concerned the mites would migrate to the cantaloupe. 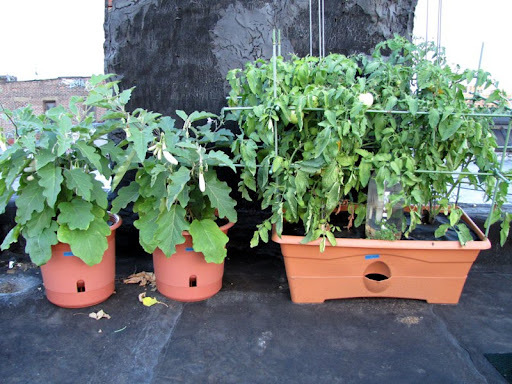 They haven't yet, but as a preventative measure I've been dousing those plants as well. 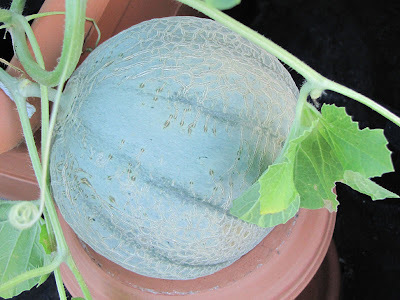 Do you see the cantaloupe melon perched on the terracotta planter? There's another one sitting in the GrowBox container and one more behind it. Just 3 melons from one large self-watering container is probably not the most efficient use of that container, but I don't care! How awesome are rooftop cantaloupes? I can't wait for these to be ready. They're developing that distinctive netting on their skin so hopefully soon. 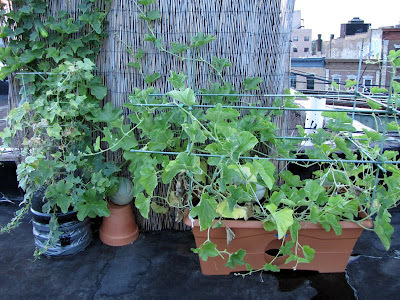 The eggplants are loving it on the rooftop. 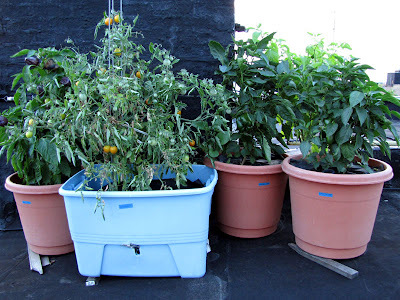 I wasn't sure how they would perform in the 12" self watering containers, last year they were in the 16" containers, but they seem to like it, I've had no problems with them so far. In my previous plant update I mentioned that the tomato plants were growing unevenly, now they're almost the same size. 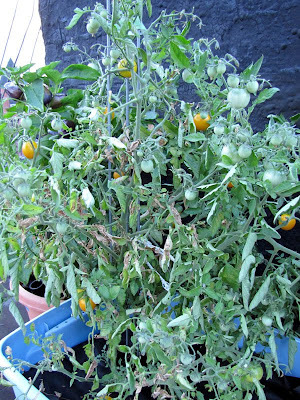 I've had to pull a couple of tomatoes due to blossom end rot because I let the soil dry out once, but other than that they're doing well. 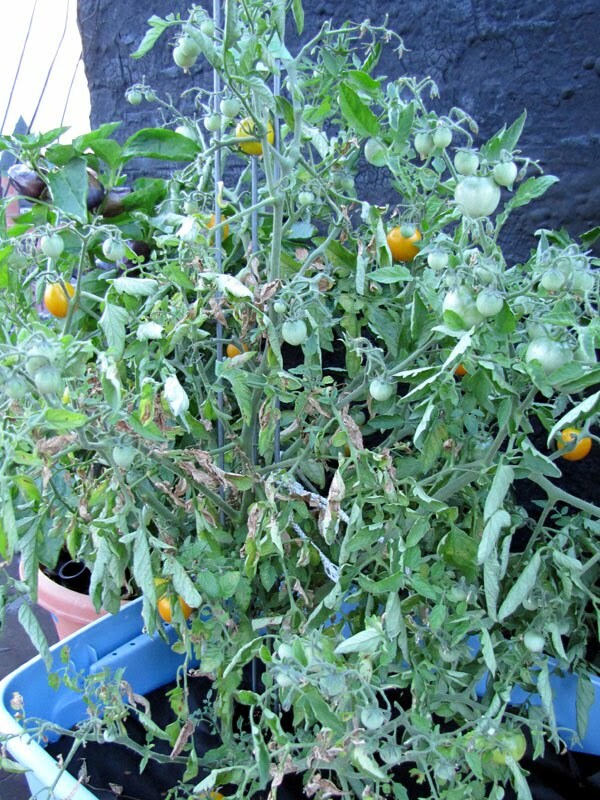 Whatever fungus is on the cherry tomato plant has not yet infected these guys, hopefully it stays that way. I haven't seen Lilac Peppers before. They are soo cool! What do they taste like? Your eggplants are doing so much better than ours. Ours have pretty much stopped growing. They seem to be not getting any bigger. I think it's because of this heat! They're taste is ok, but they're not fully ripe yet, so maybe that will change. They'll eventually turn red. When did you plant the eggplants?